Push a Ferrari to its limits on a real racetrack or ride shotgun in a Corvette Z06, or both! Located at the Las Vegas Motor Speedway, Exotics Racing is the ultimate driving experience where you stop dreaming and start driving your favorite exotic car on an exclusive racetrack. 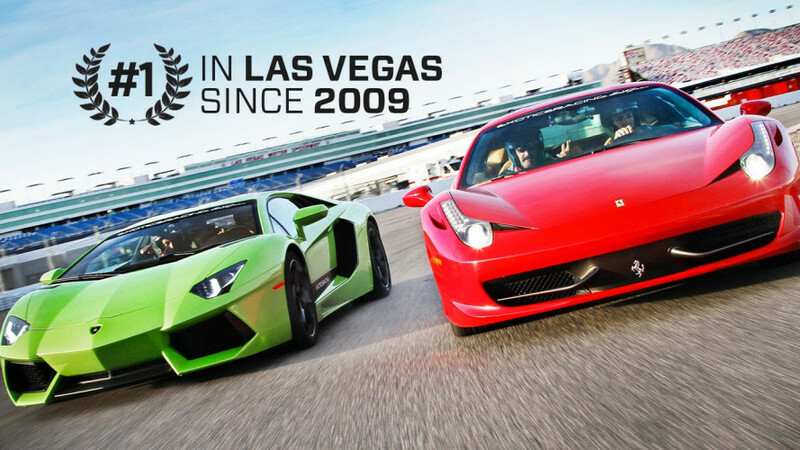 Open 7 days a week, Exotics Racing is the largest driving experience in Las Vegas. Take your pick from more than 50 exotic cars like Ferrari, Lamborghini, Porsche, Aston Martin, Mercedes, Corvette, Nissan or Audi, and then take it out for the drive of a lifetime. But not on the street; you’ll be on an exclusive 1.2 mile race track. Push the limits of the car's performance with one-on-one coaching from a professional instructor. If you'd prefer to be a passenger, ride shotgun in a Corvette Z06 as a professional driver takes you around the track for the drifting that you’ll never forget. Prior to driving on the track, you'll be provided with detailed driving instruction in a classroom environment and go on a ride along in a Porsche Cayenne GTS. Next, you'll meet your personal driving instructor who will sit in the passenger seat during your driving experience. The instructor ensures that you take full advantage of these powerful exotics while making sure you're safe. You'll learn proper driving position, steering techniques, proper racing lines, braking and acceleration with powerful cars and much more. The beauty of this experience is that you don't have to know how to drive a manual transmission. All of the vehicles have paddle shifters, so they can be driven in automatic. Ultimate Drifting Ride Along: Sit in the passenger seat of our Corvette Z06 as a professional drifter takes you around the track at full speed, sometimes, even sideways through seven turns. After your experience, you will receive a graduate certificate. Includes insurance, classroom instruction, discovery lap prior to driving experience, 6 Laps in the drivers seat. Includes insurance, classroom instruction, discovery lap prior to driving experience, 6 Laps in the drivers seat of both vehicles. Meals Included: No, but snacks and beverages are available for purchase on track. Special Requirements: Guests must be at least 18 years old and have a valid driver’s license to drive. Guests must wear closed-toe shoes. No high heels. If you do not have a means of transportation to and from our track, here are some methods of transportation that we recommend: Presidential Limo offers private door to door transportation to EXR. Presidential Limousine will pick you up 30 minutes prior to your track time directly from the front door of the property of your choice. Presidential will then return you to any property of your choice after your experience. Please call 702-731-5577 option 9 and mention Exotics Racing to book. Prices start at $65 one-way. There are also Uber, Lyft or Taxi options for transportation as well ranging from $21 - $85 one way.